Delicious "Flavorsome Curries" are great meals, all year round. 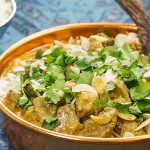 Our Lamb Curry Recipe is a Low Carb Indian Madras, it is medium spiced with a fragrant aroma it will fill your whole house. In a mixing bowl combine all marinade ingredients. Add the diced lamb and mix well. Store in the fridge to marinate for at least 1 hour, or overnight. In a large saucepan add the ghee and place over medium heat. Add the onion, cinnamon & chili powder and saute for 3 minutes. Add the marinated lamb, salt and pepper and stir to ensure that lamb is browning. Allow the lamb to cook for 10 minutes before adding the cream and reducing the heat to low. Simmer the curry, partially covered, for 1 hour. Check the lamb for tenderness. If the lamb is tough continue cooking until tender. Remove the lid and simmer for another 10 minutes. Add the flaked almonds and stir well. Add any extra seasoning. Remove from the heat, garnish with coriander and serve.